I see an occasional spellchecker around here — there was aspell and ispell a long while back, look was another one. codespell was good for picking through code for spelling errors, and I guess in an offhand way, dict is a spellchecker. Here’s a great one for stepping through a document and picking out errors: hunspell. hunspell was already installed on my Arch system, as a dependency to a dependency to a dependency to Pidgin. I see that it’s also optional for a lot of other programs, like Pale Moon or even re-alpine. Which I suppose, is a testament to its usefulness. 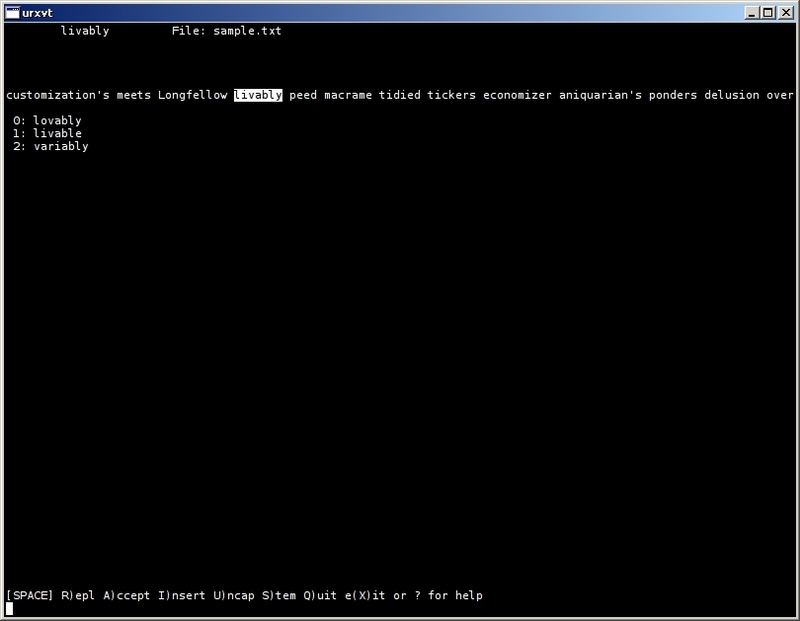 In its console interface, hunspell shows the possible error in context, alongside a list of suggested replacements. Key in the number of your correction, or use one of the other options to replace or ignore the error. Reach the end of the document, and you have the option to save. Easy as that. Besides the obvious “no color” complaint, I can’t find anything that is a detriment to hunspell. Like I said, my Arch installation had hunspell installed already, but I needed to install the English dictionary before it would work directly on a text file. And that might be part of hunspell’s greatest asset: An immense number of dictionaries. I doubt that list is complete; add to that the number of LibreOffice and Mozilla extensions that the home page implies. Plus MySpell dictionaries. And Android and Abiword support. I’m drifting off-target again though. My real desire here was to show you the terminal interface, and point out that it’s a very real possibility that you’ve already got it on your system. Install a dictionary, and hunspell is ready to roll. This entry was posted in Linux and tagged check, checker, data, file, spell, spelling, text on 2014/08/24 by K.Mandla.